Gold products were sold out at a number of stores amid a sharp increase in customers compared to previous days during the God of Wealth Day on February 25. In addition to traditional products such as figurines representing the God of Wealth and those inscribed with the words Phuc (Happiness), Loc (Prosperity), Tai (Wealth) and Tho (Longevity), gold companies have also launched a variety of other items featuring images of the dog to mark the Year of the Dog. On Tran Nhan Tong in Hanoi, also known as Gold Street, the number of customers lining up in front of shops has kept increasing and products are in shot supply. According to Le Thi Hien, deputy general director of Doji Jewellery JSC, the company had prepared a sufficient amount of gold products since the end of last year’s third quarter for the God of Wealth Day, especially those with symbols of dogs – the spiritual animal of the lunar new year – and others that represent happiness, prosperity, wealth and longevity for customers. Golden dogs and other spiritual animal products proved popular and had sold out, especially those weighing one or two chi (3.75g each), she said. “We have prepared around 250,000 products to serve customers during the God of Wealth Day, an increase of 30 percent compared to the same day last year,” Hien said. By noon on February 25, Doji had sold two-thirds of the total products and some shops have run out of supply, she said, adding that the company may have to produce more and ship gold products from other localities to Hanoi to meet rising customers’ demand. She said that the number of customers rose sharply as the God of Wealth Day took place during the three-day weekend this year, starting on February 23, and most customers were office employees, who would hope for a more prosperous and wealthier year. 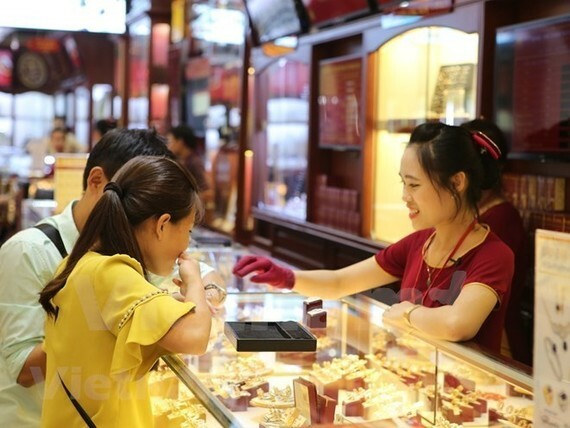 Head of the business department at Bao Tin Minh Chau Gold and Jewellery JSC, Nguyen Thi Yen, said that the number of customers had rose 15-20 percent year on year by noon on February 25 and by six to seven times compared to normal trading days. Vice chairman of Phu Quy Group, Pham Hai Au, said that the company had increased its supply for the day by 70 percent to meet the market demand and offered online and phone sales so that customers can easily purchase the company’s products. At Bao Tin Minh Chau Gold and Jewellery JSC, the selling price of SJC gold peaked at VND37.7 million ($1,675 ) per tael (each tael is equal to 10 chi) early in the day, an increase of VND40,000 compared to February 24, and concluded at VND37.4 million per tael at the end of the day. At SJC Jewellery Company, the selling price of SJC gold was set at VND37.05 million per tael early on February 25 morning. At Doji, SJC gold was initially sold at VND37.36 million per tael and increased to VND37.6 million per tael later.